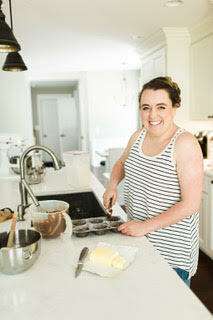 Liz Qualls is a local baker and chef. 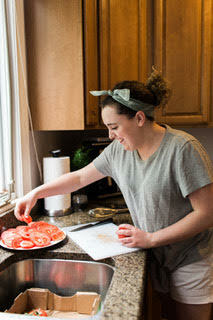 She is studying at the Schoolcraft Culinary Arts School. 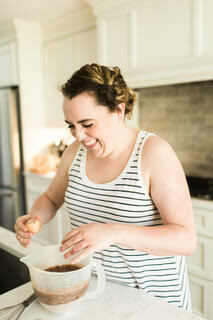 Liz currently works for a mediterranean restaurant as a chef, but runs her own catering and personal chef business. Julia Child. She taught me the importance of gastronomy, fresh ingredients, and butter. My favorite quote from her is when she said “The only real stumbling block is fear of failure. In cooking you've got to have a what-the-hell attitude. 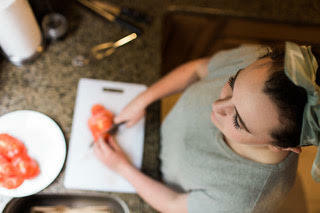 You don't have to cook fancy or complicated masterpieces - just good food from fresh ingredients. Simply, I love feeding people. Cooking for people goes father then any word I could say. There are so many words of encouragement and motivation available, but I believe food fills a deeper part of our hearts. People will forget what you said to them, but they won’t forget how you made them feel. I want to create a sense of belonging when people come to eat at the table. I believe that our biggest earthly need is to be fed and to engage in real community. There is nothing that sets my soul on fire more then Jesus and feeding His people. When did you decide you wanted to do it? I was 14 years old. Fathers day was coming up and I was trying to figure out what to get my dad. I actually googled “fathers day gift ideas” and came across a golf themed Martha Stewart cupcake recipe. I made the frosting and cake part from scratch, a mini sugar golf ball, a flag made of a tooth pick and craft paper, and I did it by myself! Then I realized that this was something I could actually do for a career, so I went for it. I took cooking classes (at my soon-to-be culinary school), never shied away from trying new recipes, and before beginning culinary school I spent a year as a bakers apprentice. One; to open a bakery in Detroit that employs women who were rescued from human trafficking, then eventually add on a catering company. Two; whatever and wherever I cook, people feel loved and accepted. That there is purpose behind what I create and feed people. ​(I LIVE for taco Tuesdays)!! Irish butter and organic brown eggs make a huge difference in your cooking. When chopping onions, put a spoon in your mouth to stop you from crying. Smoked paprika adds incredible flavor!